In October 2012 the government made the rules stricter for people out of work and claiming benefits. Since the new rules came into effect more people than ever before have been sanctioned. What does it mean if someone is ‘sanctioned’? Being sanctioned means your money is stopped. People out of work and looking for a job claim Jobseeker’s Allowance. This provides £72.40 a week to live on. 16 to 24 year olds receive less: £57.35 a week. A sanction is when an unemployed person is deemed to have broken their ‘jobseekers agreement‘. Since April this has been called the Claimant Commitment. If they are deemed to have broken that commitment their Jobseeker’s Allowance is stopped for a certain period of time. In recent months 58% of those who wanted to overturn DWP sanction decisions in independent tribunals have been successful. Before 2010, the success rate of appeals was 20% or less. How long can you be sanctioned for? A sanction lasts for a minimum of four weeks. That means at least a month with no money whatsoever. If you are sanctioned twice in the same year it will be for a minimum of thirteen weeks – so three months with no money at all. At the other end of the spectrum the longest amount of time a person can lose their money for is three years. 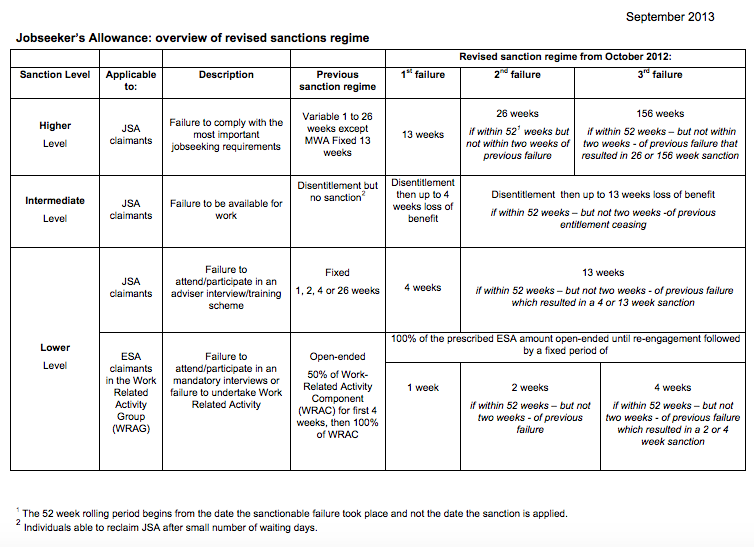 This useful chart gives an overview of the sanctions regime. When someone starts claiming Jobseeker’s Allowance they sign an agreement. This document is either called a Jobseeker’s Agreement or a Claimant Commitment. 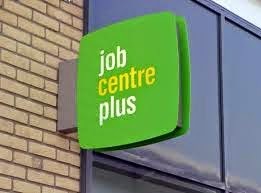 If the job centre decides you have broken one of the rules or not stuck to everything you signed up for they are likely to sanction you. The invisible unemployed: “half of unemployed do not claim benefits” – so who are they? This chart from a report by Inclusion tells a story. Actually, it poses a lot of questions. At the last count just under half of all unemployed people in the UK were not claiming benefits. That’s almost one million people and it’s going up all the time. But where are these people? How are they surviving? And why are they not receiving any support? 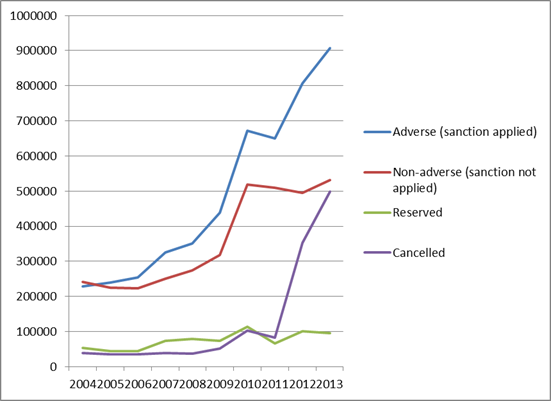 As the chart above shows the number has been rising since the new sanctions regime started in 2012. 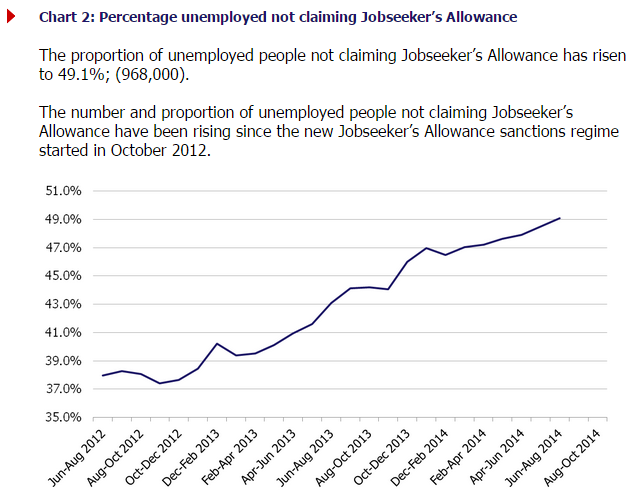 Are sanctions to blame for the rising number of unemployed people missing from the claimant count? These are questions I will be attempting to answer in the coming weeks and months.